Former CIA Director Michael Hayden wrote a long essay this week directed at incoming President Donald Trump, warning that it might be unwise to continue Barack Obamaâ€™s â€œstrategic patienceâ€� gambit as it pertains to North Korea. Hayden lamented that virtually everything short of armed conflict had already been tried. If Trump can do what three presidents before him have failed to do â€“ i.e. eliminate the nuclear threat of Pyongyang â€“ he will cement a legacy of lasting peace that history will not soon forget. North Korea is not independent State. ...are you referring to China? to use nuclear weapons to strike the United States and its allies. According to Thae, North Korean dictator Kim Jong Un is "desperate in maintaining his rule by relying on his [development of] nuclear weapons and ICBM." He was using an acronym for intercontinental ballistic missiles â€” a long range rocket that in theory would be capable of hitting the U.S.
"Once he sees that there is any kind of sign of a tank or an imminent threat from America, then he would use his nuclear weapons with ICBM," he added in an exclusive interview on Sunday. ... "Kim Jong Un is a person who did not even hesitate to kill his uncle and a few weeks ago, even his half-brother," Thae said. "So, he is a man who can do anything to remove [anyone in] his way." U.S. Vice President Mike Pence will travel to South Korea on Sunday in what his aides said was a sign of the U.S. commitment to its ally in the face of rising tensions over North Korea's nuclear program. "Withdrawing from the TPP shouldn't be seen as a retreat from the region. On the contrary, our economic presence in the region is enduring." and updating of a joint operation plan." The United States has deployed the nuclear-powered aircraft carrier USS Carl Vinson to waters near the Korean Peninsula amid rising military tensions over North Korea. The Japanese government, which has asked the United States to provide advance consultation if it decides to launch military action against North Korea, has ramped up preparations for unexpected situations. The Japanese government anticipates the possibility of a joint response with the United States should a contingency arise. Prime Minister Shinzo Abe stressed on Wednesday that the region is becoming increasingly tense. â€œ[U.S. President Donald Trump] has stated that all options are on the table. Itâ€™s a fact tensions are rising,â€� he said at the Prime Ministerâ€™s Office after receiving a written proposal calling for tougher sanctions on North Korea from the Liberal Democratic Partyâ€™s Eriko Yamatani, chief of the headquarters for the abduction issue. â€œIf an unexpected situation occurs, weâ€™ll ask the United States to cooperate in rescuing the abduction victims,â€� Abe added. The government must also figure out how to cope with the huge number of refugees expected to descend on Japan from the Korean Peninsula. They would need to be temporarily accommodated, but it also is possible that North Korean agents would slip into Japan with the intention of striking nuclear power plants, heavily populated areas and other targets. An NBC News report citing â€œmilitary sourcesâ€� claims Donald Trump and senior military officials are prepared to launch a preemptive conventional strike against North Korea if the country carries out another nuclear weapons test. Military sources told NBC News that the U.S. has positioned two Tomahawk missiles in the Korean peninsula approximately 300 miles from where North Korea will carry out its next nuclear test. The preparations come amid rising tensions in the region, with North Korea this week promising a â€œbig eventâ€� as the country prepares to celebrate the â€œDay of the Sun,â€� the birthday of communist dictator and â€œeternal leaderâ€� Kim Il-sung. Analysts believe that the country is â€œprimed and readyâ€� to carry out a nuclear test based on satellite images but that they would not be capable of enacting a full-scale nuclear attack. were simulating drills in which they would take out the North Korean leader Kim Jong-un." Supreme Leader and Americaâ€™s new President." As millions of North Koreans celebrate the Day of the Sun today, marking the birth of their cruel dynastyâ€™s founding dictator, Kim Il-sung, his grandsonâ€™s nuclear ambitions have put the nationâ€™s fate on a knife-edge and threatens peace throughout East Asia. The chubby young tyrant, Kim Jong-un, has enjoyed playing the unpredictable despot ever since he inherited power in 2011. Now he is playing with fire. This is a leader who would willingly take his small, poverty-stricken country to the brink of war with the worldâ€™s only superpower. He knows he canâ€™t win, but he also knows that a second Korean War will be a bloodbath because he has a vast arsenal â€“ everything from primitive nuclear bombs, ballistic missiles and nerve gas to 150,000 cannon â€“ with which he can hit South Korean cities and the US bases there. should the situation demand it. The banker-owned "U.S." government has been going out of its way to menace North Korea with displays of military force for years, knowing full well this would eventually provoke its mentally unstable dictator into responding with saber-rattling of his own, which would then give the same neocons who brought us the Iraq war the excuse they needed to say (in effect): "See? North Korea is threatening us! We must preemptively strike them now, or else they might use their WMDs to kill millions of Americans!" South Korea is more than capable of defending itself. We have no business being over there in the first place. You mean you didnâ€™t know it never ended? This question is always hard to answer because they donâ€™t call it the Hermit Kingdom for nothing. Very little comes out of the notoriously reclusive â€“ and repressive â€“ Democratic Peoples Republic of Korea, and not that much gets in. But occasionally there is a burst of activity that, like the eruption of a volcano, is hard to miss â€“ the recent launching of four ballistic missiles being one of them. The missiles landed in the Sea of Japan, about 190 miles off the Japanese coast, sending shockwaves throughout the region. Both Tokyo and Seoul protested, while the North Koreans characterized the action as a logical reaction to the perceived threat of imminent military action by the US and South Korea. Pyongyangâ€™s fear is not unfounded. The exercises, conducted jointly by US and South Korea and dubbed â€œFoal Eagle,â€� are a dress rehearsal for all-out war with the North. In addition to the USS Carl Vinson and a strike force of two guided missile destroyers and a cruiser, the US sent in a squadron of stealth fighter jets as well as B-52s and B-1Bs â€“ these latter capable of carrying nuclear payloads. â€œFoal Eagleâ€� is an annual exercise, but every year the amount of US firepower gets bigger â€“ and in the context of rapidly rising tensions between Pyongyang and the rest of the world, this does nothing to ease the formerâ€™s well-known paranoia. Yes, the continued existence of 10 million South Koreas, not to mention the 30,000 or so American soldiers stationed on the peninsula, is indeed â€œa complicating factor.â€� Thatâ€™s one way of putting it. Yet there was a moment when the tensions were at a low point, and the possibility of a political solution was raised: this was the result of the so-called â€œSunshine Policyâ€� initiated by South Korean President Kim Dae Jung. The goal: reunification of the Koreas, a project both the North and the South have officially endorsed for many years. The Koreans are a fiercely nationalistic people, and the halving of the nation has been a painful affair. Then North Korean leader Kim Jong Il (Kim Jong Unâ€™s father) agreed to meet the South Korean President at a three-day summit, at the end of which they signed a nonaggression pact and agreed to pursue the path of reunification. The North Koreans pulled back, and announced a military buildup. Bush upped the ante with his â€œaxis of evil speech,â€� naming Pyongyang as one of the spokes on the wheel of wickedness. 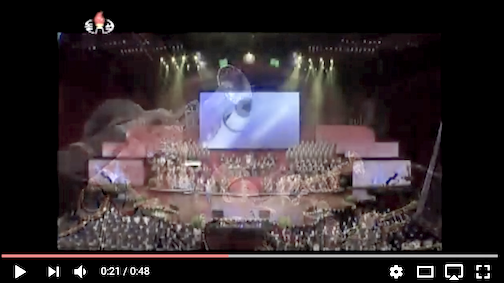 The North Koreans responded that this sounded to them like an outright â€œdeclaration of war,â€� a not unreasonable interpretation of Bushâ€™s remarks. â€œâ€¦ Among the things Bush could see were North Korean signs written in large, white Korean characters with slogans such as: â€˜Anti-Americaâ€™ and â€˜Our General is the best"â€™ â€“ a reference to North Korean leader Kim Jong-il. â€œBush spent about 10 minutes atop the bunker and then he and Secretary of State Colin Powell sat down to a lunch of cold cuts, potato chips, fruit and cookies with about a dozen US soldiers who help man the post 24 hours a day. Yet the US and the North Koreans were still bound by an agreement, reached under the Clilnton administration, by which the latter would refrain from building nukes as long as shipments of oil and the lifting of sanctions was permitted. Yet this agreement â€“ initiated by former President Jimmy Carter and signed by Pyongyang in 1994 â€“ was nixed by Washingtonâ€™s sudden announcement that the North Koreans had violated it, and that therefore the deal was off. â€œMuch has been written about the North Korean nuclear danger, but one crucial issue has been ignored: just how much credible evidence is there to back up Washingtonâ€™s uranium accusation? Although it is now widely recognized that the Bush administration misrepresented and distorted the intelligence data it used to justify the invasion of Iraq, most observers have accepted at face value the assessments the administration has used to reverse the previously established US policy toward North Korea. â€œBut what if those assessments were exaggerated and blurred the important distinction between weapons-grade uranium enrichment (which would clearly violate the 1994 Agreed Framework) and lower levels of enrichment (which were technically forbidden by the 1994 accord but are permitted by the nuclear Nonproliferation Treaty [NPT] and do not produce uranium suitable for nuclear weapons)? Here is another mess the neocon-dominated administration of George W. Bush has left us, which Trump is now supposed to clean up. But he canâ€™t do it if he reenacts Bushâ€™s belligerent bone-headedness. The author of The Art of the Deal has got to make a deal â€“ or face the prospect of a nuclear catastrophe on the Korean peninsula and perhaps beyond. Since Bush torpedoed the Sunshine policy, the North has been on a downward spiral, not only economically but also in terms of the regimeâ€™s stability. The death of Kim Jong Il and the succession of Kim Jong Un to the role of supreme leader has not made for a smooth transition. Since the regime cannot provide for even the most basic material needs of its subjects, it must maintain legitimacy by other means, which boil down to 1) supporting a quasi-religious cult centered around the worship of the hereditary Supreme Leader, and 2) the invocation of a permanent threat from the West. Fulfillment of the first part of this formula has gotten more difficult unto the third generation of the â€œroyal family.â€� Kim Il Sung, who established the DPRK, won his legitimacy by beating the Japanese invaders and fighting off attempts by the South to dominate the North. He subsequently established the Communist dictatorship, eliminated all factional rivals, and even resisted both the Soviet Union and the Chinese when they tried to interfere in his nationâ€™s internal affairs. His cult retained enough sway after his death to ensure that his son, Kim Jong Il, would succeed him unopposed, although there were some rumored purges. However, by the third generation, and under the pressure of an economic downturn â€“ and even widespread famine â€“ the semi-mystical theology of â€œKimilsungismâ€� has lost much of its mystique. The result has been signs of increased political instability and a ruthless crackdown on Kim Jong Unâ€™s part. Rumors of an attempted assassination, pitched gun battles between rival factions in the army, and signs of a Chinese plot to replace the increasingly nutty Kim Jong Un with his estranged half-brother, Kim Jong Nam, provoked a wave of violent purges. Top figures in the regime, such as Kim Jong Unâ€™s uncle, have been killed: the uncle was reportedly shot with an antitank gun! Another high-ranking figure was purged and killed for having â€œbad posture.â€� And finally the half-brother was assassinated at the Kuala Lumpur airport when two women approached him and sprayed him with poison. Although Pyongyang denies doing it, no one doubts this was done under Kim Jong Unâ€™s orders. While the North Korean regime has a long history of conducting periodic purges against perceived internal enemies, high-ranking victims were rarely killed: instead they were either sent to the countryâ€™s ever-expanding network of prison camps or else exiled. The current wave of executions signals a new phase in the ungluing of the regime. Besieged on every side by enemies both real and imagined, Kim Jong Un has one card left to play: the threat from the West. As long as he can present himself as the bulwark protecting the people from the â€œYankee imperialistsâ€� and their â€œrunning dog lackeysâ€� in the South, he retains his hold on legitimacy. The â€œFoal Eagleâ€� exercises and rumblings of war emanating from Washington bolster his faltering regime. Just as George W. Bushâ€™s spiking of the Sunshine policy was motivated by the need to appease the neoconservative wing of the Republican party and thus retain legitimacy on the home front, so Kim Jong Unâ€™s belligerence is dictated by the need to legitimize his dynastic succession to the throne of Pyongyang. North Koreaâ€™s foreign policy, like that of any other stateâ€™s, whether despotic or democratic, is determined by the political needs of the rulers at the time. To begin with, itâ€™s time to face facts: there is no military solution to the problem posed by North Korea. Pyongyang is holding the entire peninsula hostage. War is unthinkable â€“ although, unfortunately, far from impossible. As dire as the situation may seem, itâ€™s not too late to prevent a catastrophe: a political solution is still within reach. The recent impeachment of the South Korean President â€“ the daughter of a former right-wing military dictator â€“ means that her successor will be a liberal politician in the tradition of Kim Dae Jung. With the South Koreans ready to give the Sunshine policy another chance, and an American President famous for making deals, itâ€™s entirely possible that a deal with the North can be struck. However, this depends on the Trump administration having a) some knowledge of the intricacies â€“ and particularly the history â€“ of the two Koreas, and b) the imagination to reject the old Bush-neocon policy of confrontation. described so contemptuously in the memes. job of murdering his adversaries, I see that as unlikely. The emergence of the probable ICBMs, which appear not to have been flight-tested but could be in an advanced state of development, are significant: U.S. President Trump said in January that North Korea developing such capabilities â€œwonâ€™t happenâ€�. Kim and LaFoy both said new types of surface-to-ship missile systems were also unveiled. â€œI think that the treaded vehicle that is in the blue, white camouflage paint is an anti-ship cruise missile system which would make it an anti-ship coastal battery,â€� LaFoy said. As long as the neocons (who like to foment wars) are kept in their place also, the situation can be handled with the help of allies in the region. The truth is North Korea nukes are fake, the whole thing has been a ruse, if the Truman hadn't interfered North Korea wouldn't have any power; the UN has allow this for over sixty years. I don't know what or how this can be resolved but the North Korean people need help and this could be dealt with quickly if Russia and China helped. But the swamp is winning. out loud if (at least) the ICBMs are 'fake' or 'prototype'. "But while the display of the missiles will have been intended to rattle Washington at an increasingly difficult time, it remains unclear yet whether or not the probable ICBMs were anything beyond prototypes. 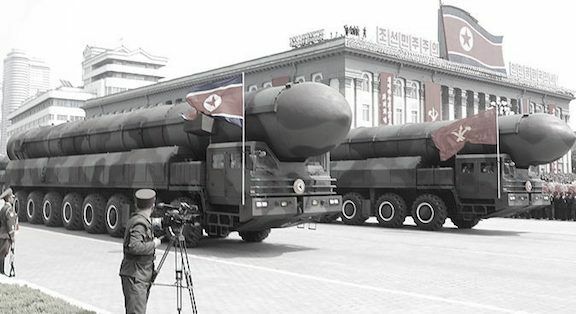 When the articulated trucks went past me I noticed the nosecone of one of the missiles vibrating up and down quite noticeably as the vehicle passed over uneven surface on the road,â€� said NK News managing director Chad Oâ€™Carroll, who was at the scene in Pyongyang. ^^^ ... meaning that the 'missile' appeared to be just a lightweight shell. US installations in both countries. Logically you are absolutely right; however this will eventually and finally be resolved much better than the worse expectations. It seems everything is going as planned!!!!! would 'beat down enemies with the power of nuclear justice'." Well, war is out. Yes, it is tempting to think oh let's just nuke the place and get rid of kim jung un. The truth is, those who are hurt in war are the innocent citizens. War ruins the people's ability to take care of themselves, to get back on their feet and hinders progress for generations. Then -- the madman -- because he has the means, gets away anyway, to do his dirty deeds another day. 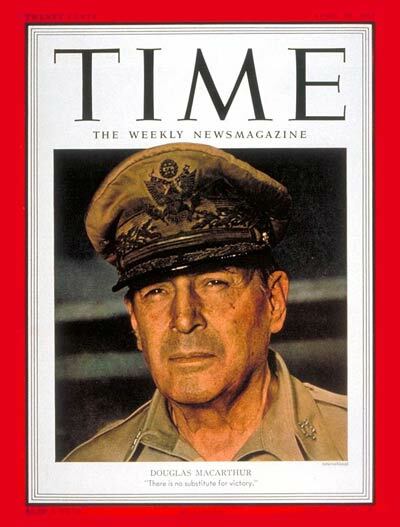 His plan was to drop between 30 and 50 atomic bombs-strung across the neck of Manchuria, and spread behind us, from the Sea of Japan to the Yellow Sea- a belt of radioactive cobalt for at least 60 years there would be no invasion of Korea from the North. The Russians, he claimed, would be intimidated by this and do nothing. On Nov. 5 1950, the Joint Chiefs of Staff issued orders for the retaliatory atomic bombing of Manchurian military bases, if either their armies crossed into Korea or if PRC or KPA bombers attacked Korea from there. Sir Malcolm Rifkind claims American intelligence has used cyber warfare to successfully foil missile tests before and that there is a â€œstrong beliefâ€� that President Trumpâ€™s administration was behind North Koreaâ€™s latest failed launch. By Richard Kemp, retired British Army Colonel I DONâ€™T think this will amount to anything at all. North Korea knows it cannot possibly survive an attack by them against either the US or its allies.Its dictator would not last long, so I think there is no chance that they would initiate any serious military action.The Americans are not interested in conflict with them, so they will not initiate anything.I also believe the Chinese are interested in calming the situation down. I think the actions of Trump in Syria and Afghanistan, if anything, make conflict with North Korea less likely.Both the strikes he ordered were legitimate and proportionate, and sent a message around the world that you do not mess with America anymore. They signalled that you may have been able to mess with America under Obama â€” but you cannot do the same with Trump or you will suffer for it.That deterrent is far more likely to prevent a conflict than provoke it. So I would say donâ€™t worry â€” there will not be a conflict between the US and North Korea. ... is this just 'hair-on-fire' scare-mongering? NORTH KOREAN 'WEAPON' CALLED EXISTENTIAL THREAT TO U.S.
WND has been reporting on the threat to America from EMP, the electromagnetic pulse from a nuclear explosion high in the sky, since early in the 2000s when former CIA chief James Wooley, former Defense Department staffer F. Michael Maloof and former Congressional EMP Commission member Dr. Peter Vincent Pry were sounding the alarm. It was only weeks later that North Korea as a possible aggressor was brought into the conversation. Nothing has gotten better since then, according to Pry, who agreed to an interview with WND on Friday, and in fact, itâ€™s worse. In fact, the sabre-rattling from North Korea dictator Kim Jong Un in recent days and weeks, the threats to destroy America, the warnings about â€œnuclear thunderbolts,â€� and more, should be taken very seriously, he suggested. 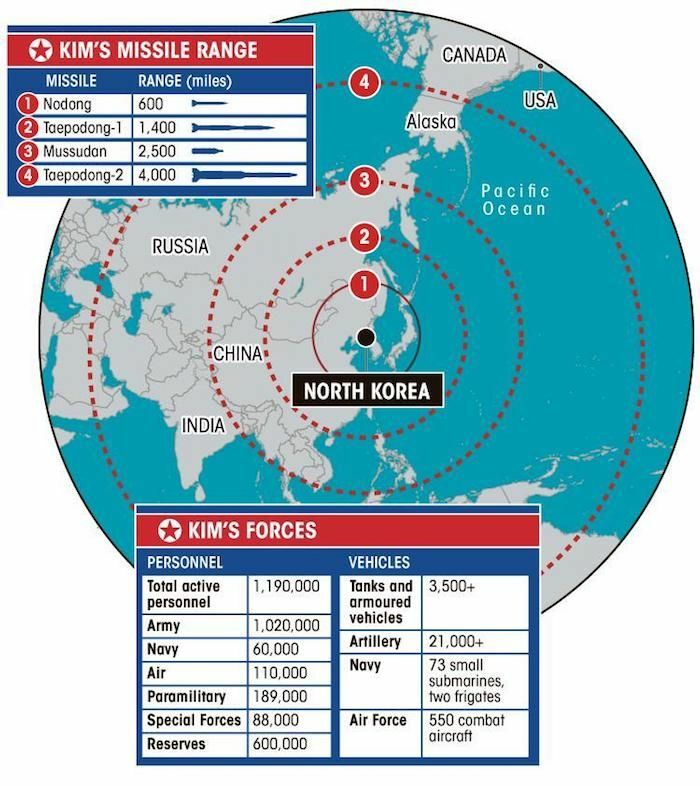 .... North Korea first launched one satellite, then a second, in oddly circuitous orbits that have them approach from the south of America, where there are no early warning systems, there are no interceptor missiles, or any defense. And the satellites, in fact, could actually contain a nuclear weapon ready to detonate." â€œWe ought not tolerate them orbiting,â€� he said, because nobody knows for sure whatâ€™s on the satellites, which are in that suspicious orbit which was identified years earlier as a possible route should the Soviet Union ever decide to mount an assault on the U.S., the south polar trajectory. 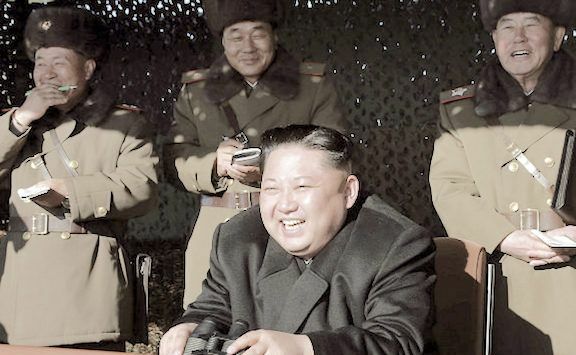 A report from just last year said North Koreaâ€™s satellites are fully capable of performing a surprise EMP attack at an altitude and trajectory that evade U.S. National Missile Defenses. "... biggest existential threat that our civilization faces right now." WASHINGTON â€“ North Korea now has two satellites orbiting over the United States capable of performing a surprise electromagnetic pulse attack at an altitude and trajectory that evade U.S. National Missile Defenses, a national security expert warned in an interview with Joseph Farahâ€™s G2 Bulletin. The satellites â€“ KMS 3-2 and KMS 4 â€“ are orbiting at an altitude of 300 miles, with trajectories that put them daily over the U.S. KMS 3-2 was launched in December 2012 and KMS 4 was launched Feb. 7. WERE KIM JONG-UNâ€™S MISSILES FAKE? 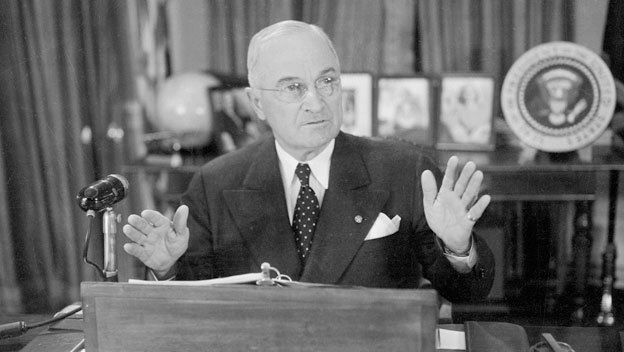 The Buck certainly did not there, Truman was a traitor and doomed millions to death and slavery. While the world watched North Korea celebrate the birthday of the founder of the rogue communist regime, many media outlets took notice of the unveiling of what are believed to be new medium-to-long-range missiles, but something else was also unveiled that gained far less notice. The Yonhap News Agency reported on the appearance of a new special operations unit during the military parade, likely intended as a display of strength meant to dissuade President Donald Trump from taking any sort of military action against the nuclear-ambitious commies. â€œOnce Supreme Commander Kim Jong Un issues an order, they will charge with resolve to thrust a sword through the enemyâ€™s heart like lightning over Mt. Paektu,â€� proclaimed the proud parade broadcast announcer while referencing the Korean peninsulaâ€™s tallest peak. But while the few media outlets that took note of the unveiling, like the U.K. Daily Mail, keyed in on the at-first-glance fearsome appearance of the special operations unit, Conservative Tribuneâ€™s own in-house military experts â€” one of whom is a former special operations officer â€” noticed a few rather humiliating details that the supreme Shortround probably wonâ€™t be too happy about. For starters, much of the equipment the â€œhighly trainedâ€� soldiers was toting were outdated designs left over from the Soviet era, such as the dual-lens night-vision goggles that destroy depth perception or the North Korean-produced AK-74 knockoff rifles that have terrible ballistics and are inferior to just about anything U.S. troops are using. On top of that, or should I say mounted underneath the rifles (tied on with paracord no less), are special tubular magazines produced by the North Koreans known as helical magazines, according to Ares Armament Research Services, (http://armamentresearch.com/north-korean-helical-ak-magazines/) which have been misidentified by many outlets as being grenade launchers. The high-capacity magazines, originally produced solely for Kimâ€™s personal contingent of bodyguards, are all but worthless in a real fight as they are extremely difficult to reload â€” particularly under the stress of combat â€” and are notorious for jamming repeatedly. The next humiliating detail is the fact that the special operations soldiers appear to be equipped with chest-mounted holstered sidearms that appear to be more than 60 years old, most likely CZ 75 semi-automatic pistols produced in then-Soviet-dominated Czechoslovakia. Those holstered pistols were attached to tactical vests in a copycat variation of the U.S. Armyâ€™s light-green digital-style camouflage, which donâ€™t match the woodland camo-style uniforms the troops were wearing, which also didnâ€™t match the apparently hastily spray-painted helmets, nor the hilariously misapplied Party City-style black and green face paint worn by the soldiers. Add in some cheap knock-off Ray-Ban-type sunglasses â€” which will keep little more than sun out of their eyes and will utterly fail under the slightest ballistics test â€” to complete the would-be special operator look, and, voila, North Korea can proudly claim it is ready to oppose a decapitating strike against their leadership by the real special operators of the U.S. military, which has been steadily training for just such an opportunity and is truly equipped for such a task. 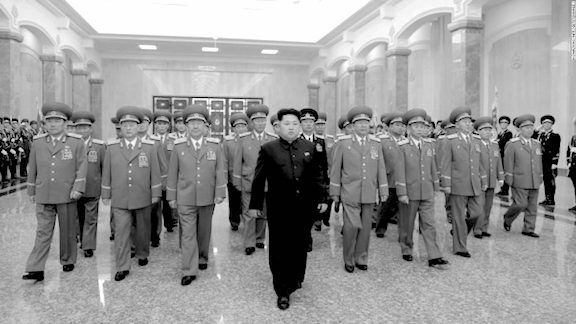 All told, for roughly $1,600, pretty much anybody can acquire virtually all of the same or similar equipment worn by these goose-stepping North Korean troops. 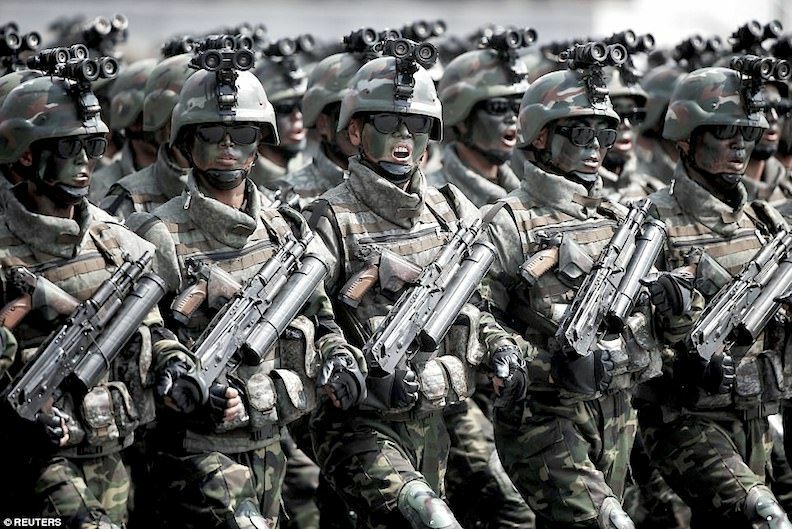 In fact, it is a fairly safe bet that there are plenty of fat, lazy, out-of-shape American mall ninjas better equipped to actually engage in battle than those who were on display in the North Korean military parade. As a final note, it was also pointed out that these high-stepping soldiers were all at times pointing their rifles at the heads of the men standing next to them, although given the aforementioned accuracy and jamming problems with the rifles and magazines, that probably wasnâ€™t as big a safety issue as it would be for others. 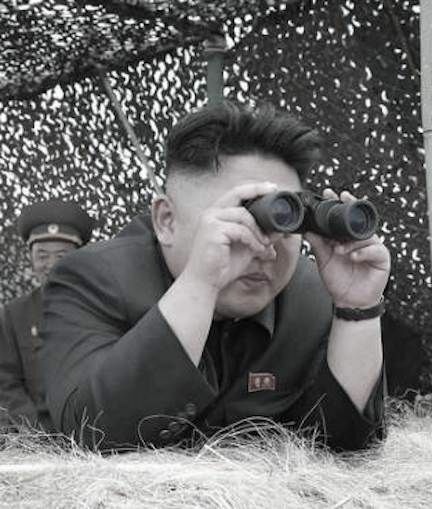 Kim Jon Un most likely was looking to intimidate President Trump into leaving him alone to continue developing nuclear missiles, but he instead has only served to humiliate himself, his military and his isolated nation by parading around a purported special operations unit that could have been mostly outfitted online via eBay, Amazon and the Cheaper Than Dirt catalog. President Donald Trumpâ€™s â€œarmadaâ€� if necessary. A U.S. Navy carrier strike group led by the USS Carl Vinson is moving into waters off Korea. The strike group, which Trump previously called a â€œvery powerful armada,â€� is taking part in joint drills with the Japanese Maritime Self-Defense Force in the Western Pacific. The Vinson and the accompanying destroyers and cruisers are expected to move into position near Korea â€œwithin days,â€� Vice President Mike Pence said Saturday, without going into specifics. Wednesday's briefing was originally scheduled for a secure room at the Capitol, but President Donald Trump suggested a shift to the White House, congressional aides said. ... Aides said they were working with the White House to schedule a similar briefing for the House of Representatives. The Washington Postâ€™s David Ignatius told Chris Matthews Monday that the â€œsmartest thing Trump has done the first 100 days of foreign policyâ€� is working in tandem with China to put pressure on North Korea. The Air Force Strike Command also announced that a U.S. long-range nuclear missile was test fired from Vandenberg Air Force Base, California, on Wednesday. The command called the test of a Minuteman III intercontinental ballistic missile "an important demonstration of our nation's nuclear deterrent capability." What to do about The Pawn NK? well for decades nothing has been done! maybe Trump told his team yesterday that a Few Bombs may be heading towards NK!!! North Korea, as Japan sent its biggest warship since WWII to protect a US supply ship. His comments came as Japan dispatched its biggest warship since World War II to protect a US supply ship, as tensions mount in the region over North Korea. Japanese naval officials declined to comment on the reports. Earlier this week, the US carrier had joint drills with Japanâ€™s naval forces. The Carl Vinson arrived in the Sea of Japan and kicked off a joint drill with the South Korean navy on Saturday, hours after North Korea launched a ballistic missile in apparent defiance of the US. ... The drill came hours after the North launched a ballistic missile in apparent defiance of a concerted US push for tougher international sanctions to curb Pyongyangâ€™s nuclear weapons ambitions. 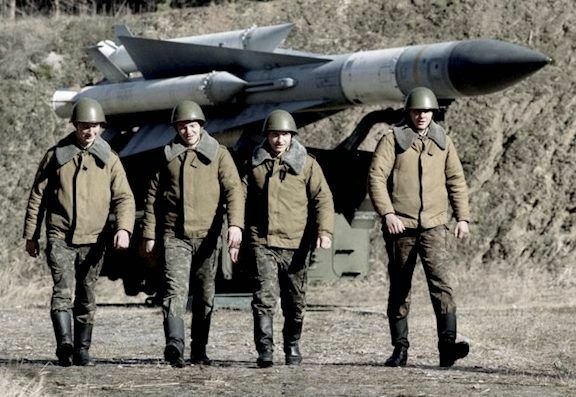 The drill aimed to verify the alliesâ€™ capability to track and intercept enemy ballistic missiles, the spokesman said. WASHINGTON (Reuters) - U.S. President Donald Trump on Sunday stepped up outreach to allies in Asia to secure their cooperation to pressure North Korea over its nuclear and missile programs. Trump spoke to the prime ministers of Thailand and Singapore in separate phone calls about the North Korean threat and invited both of them to Washington, U.S. officials said. "They discussed ways to maintain diplomatic and economic pressure on North Korea," one U.S. official said of the calls, speaking on condition of anonymity. Trump's calls to the two Asian leaders came two days after North Korea test-launched another missile that Washington and Seoul said was unsuccessful but which drew widespread international condemnation. Trump talked on Saturday night with Philippines President Rodrigo Duterte, who was also invited to the White House. Duterte has been criticized by human rights groups for an anti-drug campaign in which more than 8,000 people have died. A week ago, Trump spoke with the leaders of China and Japan on the North Korea issue. It was unclear whether the consultations meant Washington was preparing imminent action against Pyongyang. The United States may just be lining up the largest coalition possible in the region to present a united front against North Korea, said professor Jens David Ohlin, an international law expert at Cornell Law School. Mr Rumsfeld was a non-executive director of ABB, a European engineering giant based in Zurich, when it won a $200m (Â£125m) contract to provide the design and key components for the reactors. The current defence secretary sat on the board from 1990 to 2001, earning $190,000 a year. He left to join the Bush administration. a public execution as a child, of the mother of one of her friends. The woman had apparently been caught possessing a Hollywood film." The communist government of North Korea has long held a spot on the list of the worldâ€™s most repressive tyrannies, with human rights organizations regularly condemning the atrocities committed by the Kim family regime. Before the rise of late â€œEternal Leaderâ€� Kim Il-sung and the creation of Democratic Peopleâ€™s Republic of Korea (DPRK), the region boasted one of the worldâ€™s most devout Christian populations. Pyongyang, the nationâ€™s capital, earned the nickname â€œJerusalem of the Eastâ€� for its thriving Christian community. The Kim family itself was once Christian before Kim Il-sung abandoned the faith and forbade his people from practicing it. Those Christians not killed for their faith are condemned to lifetimes in the nationâ€™s notorious labor camps where they are tortured, raped, and used as slave labor. Estimates of the number of Christians in the country range from 200,000 to 400,000. Reports have consistently surfaced that the North Korean regime has little interest in respecting the human rights of individuals who are disabled, identifying them as being of little use to the country as soldiers or slaves. 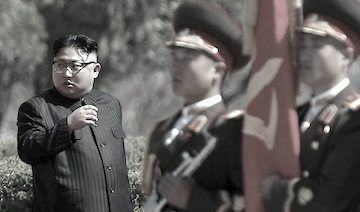 A 2012 United Nations report claimed that the Kim regime organized â€œspecial campsâ€� for the disabled, where they are sent after being classified by type of disability and removed from society. 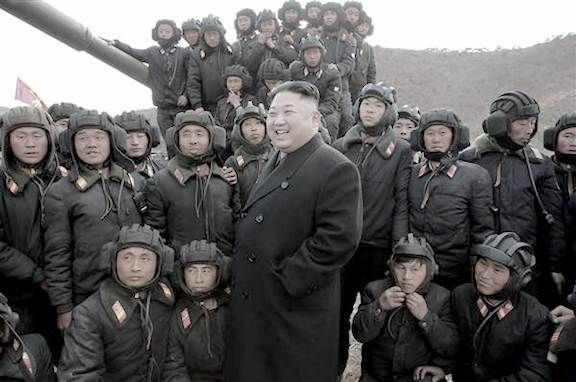 Looking at this photo: We see FAT BOY KIMMY and then his soldier's look like STICK MEN! TEL AVIV â€“ While the international community and news media focus on North Korean missile tests and the countryâ€™s nuclear program, one expert warned on Sunday that North Korea may be secretly assembling the capability to take out significant parts of the U.S. homeland via an electromagnetic pulse (EMP) attack. 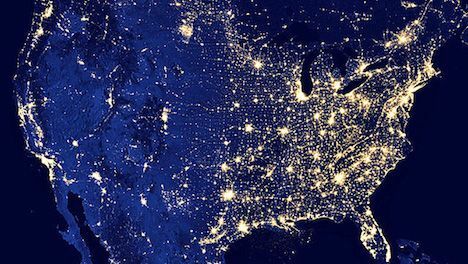 Speaking on this reporterâ€™s talk radio program, Pry pointed to two North Korean satellites that are currently orbiting the U.S. at trajectories he says are optimized for a surprised EMP attack. â€œAaron Klein Investigative Radioâ€� is broadcast on terrestrial radio on New Yorkâ€™s AM 970 The Answer and NewsTalk 990 AM in Philadelphia and online. Because we didnâ€™t during the Cold War and even today we still donâ€™t have ballistic missile early radar warnings looking south. We donâ€™t have any national missile defenses to the south. 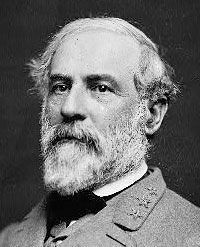 We are blind and defenseless to the south. We canâ€™t see anything coming from that direction. 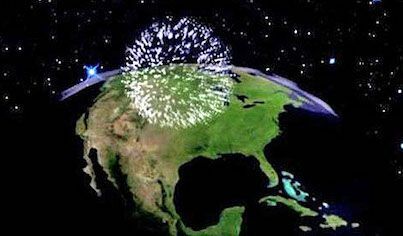 Then when this gets over the United States you light it off so that it does an EMP attack. Let USA lift sanctions against Russia. Then Russian President Putin and Chinese President Xi Jinping deal with North Korea.